The Things in Heaven and Earth develops and applies the American philosophical naturalist tradition of the mid-20th century, specifically the work of three of the most prominent figures of what is called Columbia Naturalism: John Dewey, John Herman Randall Jr., and Justus Buchler. The book argues for the philosophical value and usefulness of this underappreciated tradition for a number of contemporary theoretical and practical issues, such as the modernist/postmodernist divide and debates over philosophical constructivism. 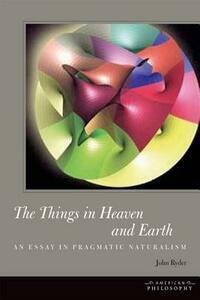 Pragmatic naturalism offers a distinctive ontology of constitutive relations. Relying on Buchler's ordinal ontology and on the relationality implicit in Dewey's instrumentalism, the book gives a detailed account of this approach in chapters that deal with issues in systematic ontology, epistemology, constructivism and objectivity, philosophical theology, art, democratic theory, foreign policy, education, humanism, and cosmopolitanism.